Poker Twitter went from bickering over tournament staking to celebrating Tiger Woods for his improbable golf Masters victory, his first major title in 11 years. Golf pundits had written off Tiger years ago. They said he could no longer hand with the young stars on the PGA Tour, and predicted he’d never win again. Tiger’s friend, Phil Hellmuth, knows how that disrespect feels. The game of poker had passed him by and he would never again win a WSOP bracelet, or so the critics said. But then a little thing happened at last year’s World Series of Poker. The guy who supposedly couldn’t win tournaments anymore shipped his 15th bracelet, extending his long-held record. Unsurprisingly, Hellmuth was quick to congratulate Tiger on his shocking Masters win. Woods won his first golf major since 2008, and 15th in his career, matching Hellmuth’s WSOP bracelet total. He trails only Jack Nicklaus who holds the record with 18 major titles. Tiger has come a long way over the past year. 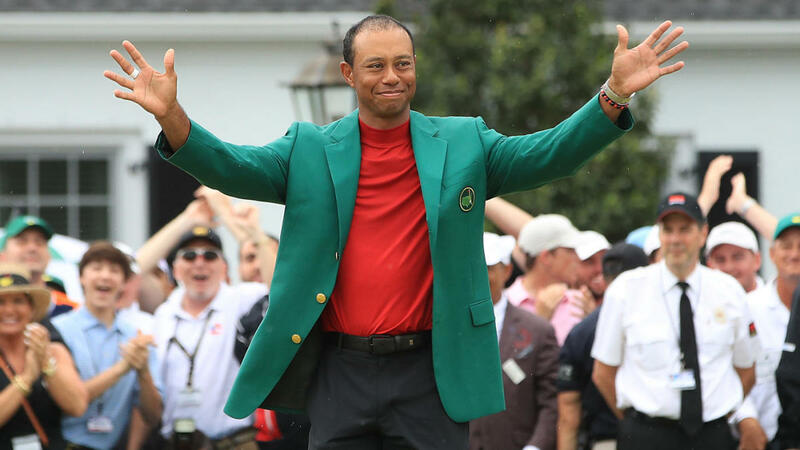 His Masters victory, which is the golf equivalent of the WSOP Main Event or Poker Players Championship, made for the ultimate sports redemption story. In September 2017, nine years after his marriage collapsed due to his numerous extramarital affairs – Tiger, apparently had a thing for waitresses – Woods was attempting to recover from a back injury that threatened his career. Forget winning golf tournaments for a moment. Arguably the greatest golfer ever was in jeopardy of never again playing professionally. But here we are less than two years later and Tiger is back on top. And the poker community was so inspired by his performance on Sunday that everyone briefly paused the tournament staking drama that was polluting Poker Twitter the past week. Now seems like a good time to address my admiration for @TigerWoods as a person. When people choose their heroes it could be because of their demeanor, their performance, the way they treat people, the way they engage their fans, or a variety of other reasons. Seeing one of the goats quickly fall to the bottom due to both mental and physical issues makes them more relatable. From godlike to human. David Williams, the 2004 WSOP Main Event runner-up, admitted he wasn’t a big fan of golf growing up. He said that his 16-year-old self would have never woken up early to watch golf. But like so many others, his passion for the game grew later in life thanks in large part to Tiger Woods. Immediately after drooling over Tiger’s Masters performance, Poker Twitter moved on to obsessing over something equally entertaining: the season premiere of Game of Thrones. 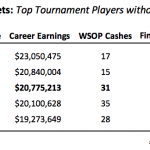 Data: Who Are the Best Players Today to Never Win a WSOP Bracelet? This was my biggest sporting highlight for this year. The best player ever is back. Fantastic to see a guy that never gave up be rewarded. Well done Tiger, it is good to see that you are back on track and winning golf tournaments again. well done, i see it and was awesome.. i like when a oldstar is back.. thats the proof that when you want to play again, you can go back and win.